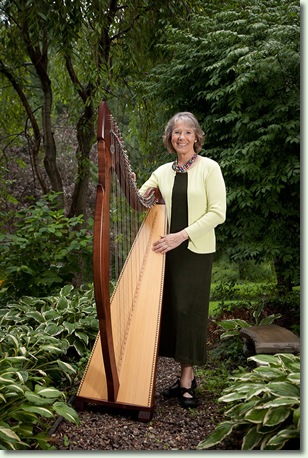 Roxanne has performed numerous presentations and demonstrations of harps and the music they create. These can be tailored to meet the needs of any organization. Please visit the Presentations page for more details. Music is a powerful, therapeutic tool because it is a universal language that crosses cultural lines, taps into body rhythms, generates immediate responses, and is used in rituals from birth to death. Music can organize the brain by the interaction between the emotional and memory regions of the brain, and can do so in ways that the chaos of normal life cannot. In the therapeutic realm, live music is not done as a performance, but as a service. Its benefits effect not only the patients, but the caregivers, staff and family. Peaceful music seems to mellow out what can typically be a stressful atmosphere. 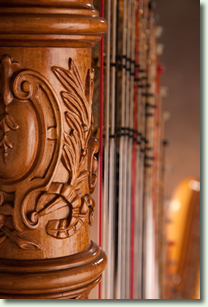 The harp is gaining popularity as the instrument of choice for therapeutic work. It has one of the most fluid and lyrical sounds of any instrument and subtly fills a room. 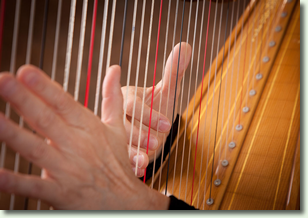 Since healing includes de-stressing the human body and mind and elevating and inspiring the human spirit, the harp effectively and beautifully meets this challenge. Besides merriment, ancient and current uses of the harp include soothing, healing, enhancing slumber, and helping with grieving. As a therapeutic musician, Roxanne plays live music at the bedside of persons who are faced with physical, emotional and spiritual challenges. This interaction generally occurs in the person's home, hospice or clinical setting. She uses the inherent healing elements of live music and sound to enhance the environment for the patient, making it more conducive to the human healing process. Healing does not mean a cure. Rather, healing is defined as movement toward mental, physical, emotional and spiritual wholeness. Roxanne feels called to play therapeutic music on the harp in medical settings. She believes this is where her special gifts and talents are, and she considers this to be a ministry. When she is able to connect with people on this very personal level and can even temporarily ease physical, emotional or spiritual discomfort, she feels very blessed. In these situations, her music is not played as a performance or entertainment; rather it is music that serves with the intention of benefitting the wholeness/wellness of the person with whom she works. 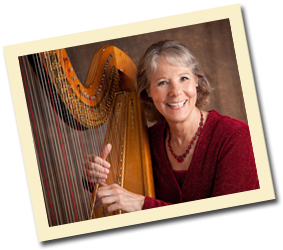 Roxanne Ziegler has been a Certified Music Practitioner (CMP) since 2004 through the Music for Healing and Transition Program and also had training through the International Harp Therapy Program. As part of her training, she was required to complete an internship working one-on-one with patients. She chose Clifton Springs Hospital for her work because the philosophy of the hospital is open and welcoming to complementary therapies. After her internship was completed, the hospital engaged her healing harp services and she has been playing there weekly ever since. At Clifton Springs Hospital, she has opportunities to work with patients in pre- and post-op, ER, ICU, hospice, Cancer Center, Special Services, the dementia unit, the nursing home and at patients' bedsides in their rooms. This continues to be an overwhelmingly positive experience for patients, staff, visitors, and Roxanne! From 2000-2006 she worked at the Lipson Cancer Center at Rochester General Hospital. Roxanne often meets folks she played for at the Center during that period, and they continue to express how meaningful her music was to them during their time of need. 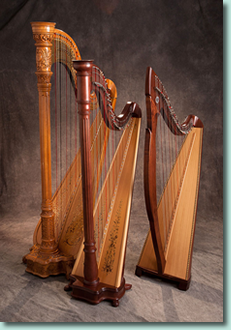 The softness, subtleness and serenity of the harp have profound and long-lasting, positive effects. Roxanne serves on a weekly basis at the Jewish Home of Rochester, playing for residents in group settings and in private rooms. She plays once a month at the Edna Tina Wilson Living Center in Greece. Other senior, independent, and assisted living facilities such as The Episcopal Church Home and St. John's Home also invite Roxanne to provide service music on an occasional basis. She was interviewed about the healing music of harps in this article from the Democrat and Chronicle. Family or friends of hospital patients, nursing home residents, and hospice patients often wish to do something special for them but find it difficult to decide on something appropriate. A unique gift of sensitive soothing, healing music played by a talented, experienced, caring musician brings comfort to everyone who hears it. The gift of therapeutic music to those in hospitals, nursing homes, hospices, or at home gives comfort to the afflicted, the caregivers, and to family and friends. The warm tones are soothing and healing and can bring comfort at wakes, funerals and memorial services.